Freelance editors work directly for you, the writer. They’re behind the scenes, quietly correcting grammatical errors and offering overall suggestions for improvement for your manuscript. 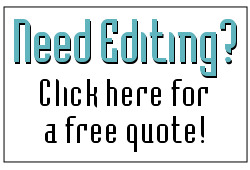 A freelance editor can smooth out plot problems, spot timeline errors, and eliminate typos and other distracting mistakes. They can also improve your chances of being noticed by an acquisition editor or a literary agent. If you’re self-publishing, it’s even more important to get your work carefully proofed or edited. Most PODs offer editing services for an extra fee, but it’s up to the writer to make sure his or her work is in near perfect form before it goes to print. A freelance editor is often a less expensive alternative, and we can help you avoid embarrassing mistakes. Writers and editors share a love of the written word. We’re voracious readers, daydreamers, and poets. Bookstores call to us like the open road calls to the drifter, but here’s where the road diverges. Writers have the freedom of creative license, while editors are trained in the “rules” of writing—although most editors know that there’s a fine line between following the rules and doing what’s best for a particular manuscript. A good copy editor, for example, keeps the general rules of the English language in mind but also preserves the writer’s unique voice. Each writer is different, and sometimes their style overrides mandates handed down by the grammar police. A good editor will recognize and nurture individual style. It takes a certain persnickety type of person to really care about the mechanics of the English language and instinctively make appropriate improvements. We’re the type of people who are horrified by advertisements proclaiming, “Were here to help get you’re dreams started!” or are jolted by mismatched quotation marks on a billboard. As an editor, I focus on the work line by line, looking for spelling and grammatical problems, consistency, clarity, word choice, sentence structure, verb tense, dialogue, and other issues of style. I also look at the big picture and flag general problem areas in plot, character, point of view, and overall flow. So, what can a freelance editor do for you? For one thing, most writers find it extremely difficult to proof their own work, and an objective reader can offer a careful review with a fresh eye. The result should be a clean, well-formatted version of the original. The high-profile agent you’re hoping to attract may be willing to give your manuscript a second glance if they’re not distracted by poor presentation and awkward sentence structure. A professional editor should have a firm grasp of the English language, as well as a solid working knowledge of at least one style manual (I prefer the Chicago Manual of Style) plus an extensive library of reference books. The Internet is also full of secret sites that make copy editors swoon with delight, sites where we can double-check song lyrics, verify the location of an English castle, or check the spelling of a Roman emperor’s name. Should your character make his confession to the priest or the minister? Are you alluding to (or eluding?) a novel by Stephen King…or Steven King? A good copy editor will know…or know how to find out. You have completely mastered the mechanics of the English language, from punctuation to spelling and grammar, and your manuscript is technically sound. Constructive criticism causes you ulcers. You’re self-publishing and trust that your book looks pretty darn good as it is. You know that your book can stand on its plot alone, and literary agents are sure to overlook the awkward formatting and misspellings. Making a good first impression is not a priority.